Remember how hot it was during summer that some of us wished it’s rainy season already? Guess what, it’s here! lol. It’s been raining hard for the past week and I hope that everyone is safe because I’ve been hearing news about the flooding in Metro Manila and the great traffic caused by heavy rains. In fact, here in our place, some are already flooding too. Please take care, you guys! Nevertheless, this gloomy weather makes it really difficult to go out, and even get out of bed! I wish I could spend all day sleeping and staying in bed, but I can’t and I shouldn’t! lol. For those who don’t need to commute to work, what do you do at home to make the bed weather a little more productive? Here are some of the things we do during rainy days. 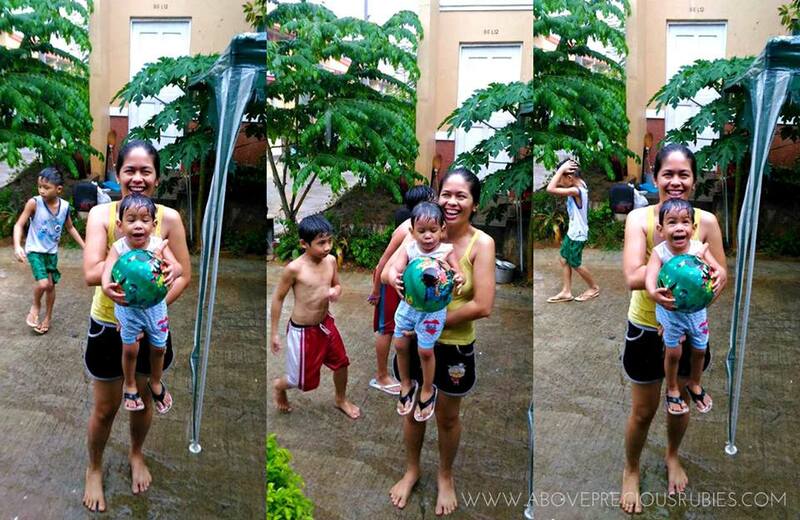 If you are like Nate and I who love to play in the rain, do this! lol. Every once in a while we bathe in the rain, together with other kids in the neighborhood. The heavier the rain, the better. Haha. I like to do this because it takes me back to my life when I was a kid – a worry free, happy kid. Plus, it’s an awesome bonding with Nate. I’m fortunate that we have awesome neighbors who completely understand that, in fact some of them do the same! Haha. Many people love to take advantage of the rainy days to watch movies. Although I don’t really do this often, because first, Nate can’t stand watching an entire movie, second is I don’t want to watch rated PG movies with him, even those with fight scenes. But sometimes, we’d watch cartoons together. This very seldom happens. Huhuhaha! Champorado, pancakes, sopas, pancit, soup, saging na saba, name it! Ilabas ang lahat ng masarap kainin sa tag-ulan! Haha. I don’t know why but there’s always something about rainy season that makes us want to eat! We all love to do this, don’t we? Specially with our kids and hubby! Or even do it alone, it’s just nice to get lazy over the wonderful bed weather, isn’t it? You can read even read your fave book, or watch your fave movie, or talk to someone online, or do nothing but sleep! Haha. Filipinos are best known for their awesome talent in singing karaokes! Haha. When it rains, you can “birit” any song you want! Wag mag alala, di ka maririnig ng kapitbahay pag pumiyok! Haha. But if you’re like us, who don’t have videokes, you can just sing any songs with your kids in acapela or while playing guitar! Rainy days makes you want to just sing and dance with your love ones! Haha. What do I do on rainy days? When I was a kid, I play whatever is available. We grew up poor (and remains poor) and I really did not have toys… ahhh, we did have encyclopedia, it was my best friend! Love your positive vibes lang talaga. Love to sing, eat, watch movies, and sleep also during rainy season. Pero maligo sa ulan, haha, miss ko na sya gawin. Bathe in the rain!!! Brought back childhood memories plus the bangkang papel. I notice nga malakas ako kumain pag umuulan. I would love to bathe in the rain with Cloud but we have to wait until he is a bit older. Baka magkasakit at ako ang mapagalitan hehehe. Yes, naliligo kami right after bathing in the rain, and an extra dose of vit C as well! I miss playing in the rain, we always do too when we were young. I just become a burrito and stay in bed during the rainy days. It's becoming so stressful to go out when it rains in Manila. It's just so hassle. But surely, bathing in the rain looks fun! Gawin natin minsan. haha. punta kami jan sa inyo. lol. Same here! haha. And yes, I remember when we were kids, we'd be so happy pag bumaha. We didn't know it wasn't good back then. I would love to try Smule! Haven't downloaded that yet, but I think it's fun! Try mo uli sis, haha. Ako nag eenjoy talaga ako, kahit matanda na ako . lol. hahahah! true! Nakakatamad lalo bumangon at mag prepare! lol. It does! It's one of the things we love to do when raining. That's what we do too most of the time but not the last, though. HAHHAA No so blessed to have a golden voice so don't bother ask. What I love the most whenever it rains, eating! You bet! Awts! So sorry to hear that! Buti nalang kami di nagkakasakit pag naliligo sa ulan. haha. And yes, super sarap magbabad sa bed pag ganito kalamig ang panahon! Wow, that's an awesome movie time with your wifey! I wish I could do that with my husband too, but he's currently away from us. So, I guess, I'll do other stuff for now. lol. hahaha! That's fine! eating is a lot better that singing! lol.